Corrugated iron buildings were once a common sight in the Highlands around the turn of the century, but have now become something of a rarity. Originally known as portable houses, they first appeared around 1830, but only became widely adopted toward the end of the 19th century. In those days, corrugated iron was a more substantial material then the flimsy sheet metal product we know today, and the houses produced then were of significantly better quality than similar structures produced today. The original so-called corrugated iron was actually wrought iron, much thicker and robust than the thin, flexible sheet material the term refers to today, and galvanised to resist the weather. The houses were usually purchased as fairly inexpensive kits, able to be erected quickly, and capable of serving the needs of a small community, being available as ready-to-assemble kits for domestic houses, offices, stables, ballrooms, churches and hospitals, as described in the catalogue of one the suppliers of the time, William Cooper Ltd. Possibly the most well-known corrugated iron building in the world is sited in Scotland, in the far north of the country on the tiny island of Lamb Holm in Orkney, and is the Italian Chapel built by the Italian PoWs who laboured there for four years on the Churchill Barriers, from 1940 onward. Created from two conjoined Nissen huts, the chapel is the only surviving building from the site of Camp 60, the World War II PoW camp where they were interned. In September 2007, a corrugated iron house was offered for sale, and generated considerable interest. Ballintomb Cottage, Dulnain Bridge, Strathspey, was originally constructed as a summer house by a local farmer, and cost just �425 at the turn of the 20th century. The farmer would move his family there for a couple of months each summer, while he rented their farmhouse to wealthy holidaymakers. Offers over �175,000 were invited for the property, described as a luxury three bedroom house with kitchen, sitting room, dining room, and two bathrooms. The estate agent declared that the surveyor who had examined the property commented that it was probably better built than most of today's houses. The new owner will need to budget for repainting, as Ballintomb Cottage was last painted externally approximately 15 years ago, but was left unpainted to show the quality of the galvanised metalwork. The construction of these iron buildings was fully detailed in the catalogues. They quote that "sheets of standard Birmingham grade galvanised iron are used, truly and evenly corrugated, thickly coated with pure Silesian spelter, true and even in temper, and free from flaws and cracks." Floorboards were supplied of thoroughly seasoned deal in 1" thicknesses and lining boards in 1/2" tongue and grooved. The walls were insulated by a liberal use of felt. A handsomely designed residence, delivered and erected cost approximately �425. Three metal clad cottages at Succoth are known to have been used as accommodation for staff working at the Loch Long Torpedo Range, and are believed to date from the 1940s. Demolition of the abandoned range buildings began during 2007, at which time they were also set on fire. At the time of writing (2007), it is not known if this work will include the cottages, or if they will survive. Timber framed corrugated iron clad building were also used for community buildings such as church halls, with an excellent example still to be found at Toward, a few miles south of Dunoon. Reportedly now derelict and abandoned, this corrugated iron building in Brechin is known locally as The Little Tin Church. Located across the Clachan Bridge linking the mainland to the island of Seil, Argyll & Bute, the island's Tin Church lay derelict until 2005, with demolition likely, when it was purchased by a couple who saw its restoration as their only route to making an affordable move to the area. With their plans successful, the property featured on Channel Five's 'Build a New Life in the Country' series, which followed work on the property during 2006. The completed project provided sufficient living space not only for the family home, but also allowed the rear of the property, formerly containing the altar, to be converted to a holiday let, providing income during the summer months. Acquired for �80,000 and with at least further �70,000 spent in renovation, the original building was purchased for �100 in the early 1900s. Located towards the north end of the small settlement of the small settlement of Carrick Castle on the western shore of Loch Goil, Argyll & Bute, is a corrugated iron church which is still in use by the Church of Scotland (2008). While the building dates from Victorian times, its history is unknown. The settlement takes its name from Carrick Castle, once a royal stronghold, which dates from the 15th century and has its remains on a rocky peninsular platform. The Earls of Argyll served as its hereditary keepers. On December 12, 2008, The Dunoon Observer carried the sad news that the Church of Scotland had announced that the Carrick Castle church, which it noted had been built around 1892, was to close as a result of structural problems associated with rotten timber. Although only one monthly service was held for its small congregation, the church building also served as their community hall, and the villagers have commissioned their own structural engineer's report of the building, with a view to saving a resource which would be be greatly missed, as it is the only social facility left in the area since it has already lost its local hotel and shop. Located towards the southern end of St Catherine's, a small village on the eastern shore of Loch Long in Argyll and Bute, is a corrugated iron hall which was renovated by the St Catherine's Christian Community, having had a new roof installed in 2000. The history of the area and the building were printed on a board attached to the building. We have since learnt (2011) that the hall has been converted into a private residence. A tiny chapel which comes under the parish of Arisaig and the Small Isles. Sunday services, according to the notice, are "monthly as indicated". Steel framed corrugated iron clad buildings were commonly used by small businesses in country areas, particularly for engineering works. Although somewhat altered, this example still stands in South Street, Houston, Renfrewshire. Previously garage premises, the vent from the underground fuel storage tank is still visible. East Fortune Airfield and East Fortune Hospital share the same ground, the hospital having been developed as a tuberculosis (TB) sanatorium in 1922, on the site of the naval airship station which was developed there during World War I. The site contains many original buildings, described as Corrugate Iron Buildings. Reactivated during World War II, the airfield was abandoned after the conflict, but has survived as the Scottish Museum of Flight. The hospital continued to admit TB patients until their numbers began to fall in the late 1950s. Beginning in 1956, mentally handicapped children were admitted, then adults from 1959 onwards, until it was finally closed in 1997. As part of a deal to allow luxury houses to be built nearby, a developer has agreed to restore and incorporate the surviving buildings into the development, which should help ensure the buildings are retained and maintained, as the cost of doing this alone would have been prohibitive. Hopefully the area will get housing that would otherwise not have been allowed, and historic buildings that would have been left to decay will survive. 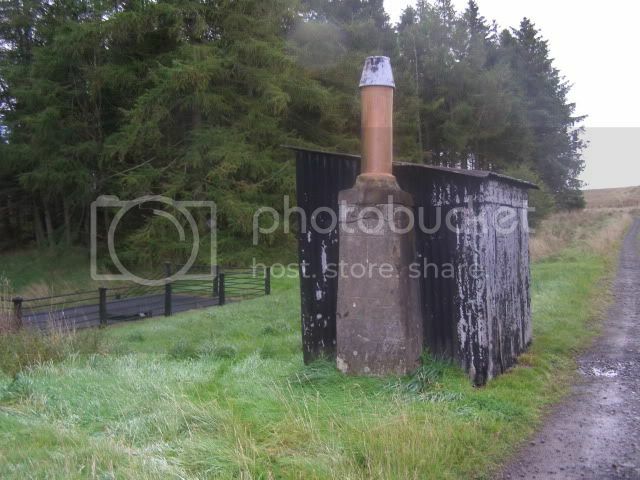 An example of a corrugated iron building which has been used to cover a reservoir reported to serve Whitehill can found at Loch of Auds, just south of a road junction on the B9139, west of Banff, and is described as still serving that same purpose when photographed in 2006. The building seems to be similar to that used by the military during World War II, but with no windows present. This may link it with Boyndie Airfield which lay a short distance to the southwest, but there is currently no evidence available to support this thought. Beside the road to Tighnabruaich lies a Nissen hut which has been reused by the farmer. It is assumed to have come from the Combined Operations bases in the area. It is not known if this is the original site of the hut, or if it was later moved to this spot. Lying on the eastern side of Lindsaybeg Road to the southwest of Lenzie is a large Nissen hut which has been reused as a barn. 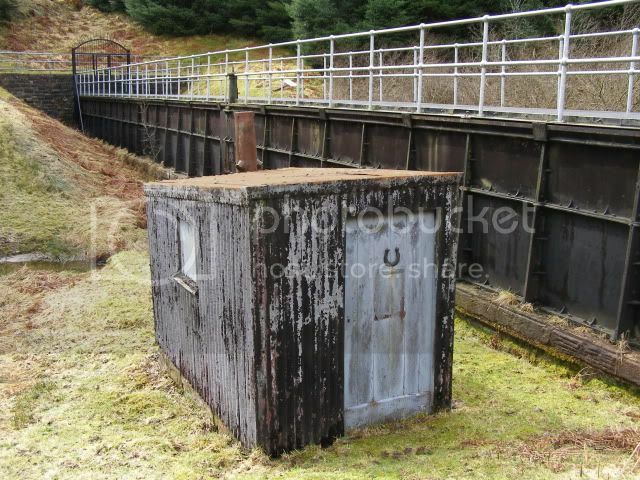 This corrugated iron building was still in use by Argyll & Bute Council at Lochgilphead when the picture was taken in 2009. Its history is unknown but it may be a relic of the area's past involvement with World War II. This building sits beside the main road at Ardrishaig Pier and is thought to date back to the days when HMS Seahawk was established there during World War II. This picture of the boatyard at Kilcreggan was taken during the 1980s, but the shed was still in use in during 2009. Two garages lie almost opposite one another on the road to Loch Striven. The small Nissen hut appears to be a recent construction, suggesting that someone may still be manufacturing huts after the original pattern. The material used in not known, as the distance from the road meant it was not possible to discern if this was new galvanised steel or aluminium sheet. Formerly the church hall belonging to St Bartholomew's Episcopal Church, and known locally as The Tab (presumably short for tabernacle), this now run down building lies in Binnie Lane, Gourock. A red painted corrugated iron church in Dalswinton Woods, southwest of Auldgirth, Dumfries. This greyish shed stood for more than 50 years from the early 1900's, beside the Loch at Burnfoot, Arden. In fact it consisted mainly of slatted wood, with a corrugated iron roof, from which its name presumably derived. It was built to house a beautiful private steam launch, the last on the Loch, which was still making the occasional appearance in the 1960's. The shed was demolished about 30 years ago, but the launch had gone before that. -Vale of Leven place names beginning with T.
Details unknown. Only the pic and name was uploaded. The Nissen hut was invented during World War I, in 1916, by Major Peter Norman Nissen (1871 � 1930), a Canadian mining engineer and officer in the 29th Company Royal Engineers. Only five months passed from the initial concept in April, to production by August. Nissen's inspiration was to render thin, flexible steel sheeting semi-rigid by passing it through a corrugating machine, and then forming the resultant material into a semicircular tube. The flexible sheet became much stronger and could form not only the cladding, but also the structural part of the final building. Nissen huts were much used in both world wars (over 100,000 were used in the first conflict) as they were cheap, easy to build, and light to transport. The Nissen hut was constructed over a lightweight steel framework onto which wooden purlins were bolted with J bolts. Assembling the sheets with the corrugations running vertically meant the sheets could be overlapped and nailed to the purlins, providing a continuous wall and roof. The components were so light that a complete 16 ft diameter hut could be loaded onto a three ton lorry, standard transport at the time. The Nissen hut was produced in standard diameters of 16 ft, 24 ft and 30 ft. Options, such as dormer windows, were easily incorporated by the use of additional steel framework and shorter sheets. Originally, the ends of the hut were made of timber, as were the floors, but when hundreds of thousands of these huts were produced in the UK during World War II, the ends were often of brick, with concrete floors, as these materials were more readily available locally. 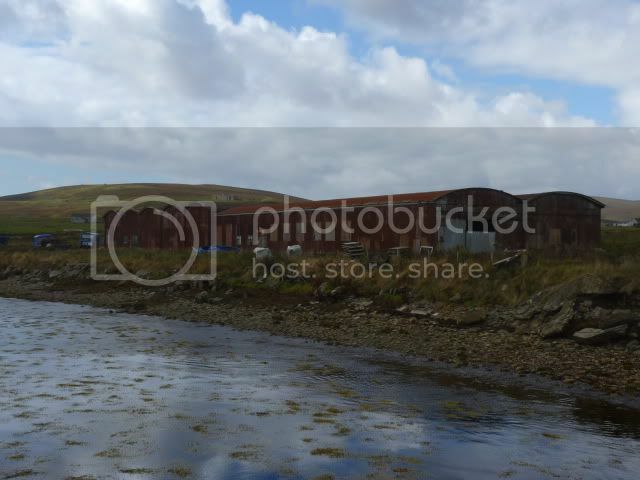 Many Nissen huts still survive, with sites such as the Cultybraggan Training Camp still retaining working examples. Several privately owned huts can still be found on the Rosneath peninsula, and the former magazine buildings of the Peaton Hill Magazine are still in place. 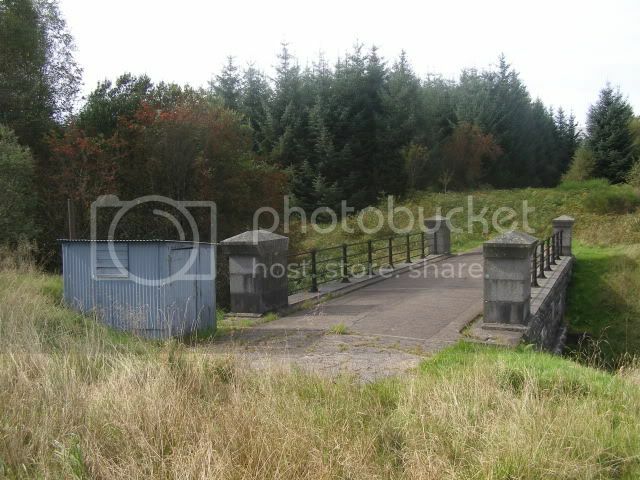 Further examples can be seen around the area occupied by the former Rosneath Naval Base. The road between Kilcreggan and Rosneath has another, said to have been dismantled by the farmer and rebuilt to serve as as an animal shelter at its new location. When the US entered World War II, it became clear that they would need a quick solution to accommodate their personnel posted all over the world, and they set about redesigning the British Nissen Hut. Their main innovation was to assemble the metal sheets with the corrugations running horizontally, so the hut could be constructed to any diameter using standard sheets of corrugated iron. However, omitting the second rolling process lost some rigidity and a heavier framework was required. A further innovation was a change in the construction of the framework from a 'T' to a 'U' shaped section, which meant that the cladding could be nailed straight onto the framework using special nails. Dating to 1941, the US Navy commissioned George A Fuller of Quonset Point, Rhode Island, to produce their new hut, and the first Quonset huts appeared within two months, with the new design resulting in lighter and smaller shipping requirements than the original Nissen hut. The prototype was 16 ft x 36 ft, later standardised 20 ft x 48 ft with a 10 foot radius. Larger sizes were developed for use as stores, with the most common being 40 ft x 100 ft. The original huts were formed from an arched 'T' section steel member formed into a radius of 8 feet and clad with corrugated steel sheets. The interiors had a pressed wood lining, insulation, and tongue-and-groove wood flooring, providing a clear floor which allowed for 96 different program spaces required by the military which included functions such as showers, latrines, dental offices, isolation wards, housing, and bakeries. Huts could be placed on concrete, pilings, or directly on the ground with a wood floor. The two ends were covered with plywood, and the entire standard assembly could be broken down into a shipping volume of 350 cubic feet, weighing some 12.5 tons. World War II saw over 170,000 Quonset huts being manufactured, and although temporary in concept, their well engineered structures means that numerous examples have survived and are still in use. After the war, the US military sold off their the surplus Quonset huts to the public for $1,000 each, with the functionality of the design leading its adaptation to numerous civil applications. These were basically similar to Nissen huts but larger, and used as hangers and large storage huts. Named after the Home Secretary of the time, John Anderson, later Sir John Anderson, these air raid shelters were rushed into production at the commencement of World War II for issue to householders. They were constructed from special sheets of corrugated iron, straight at the bottom, with the top half rolled into a quadrant. Needing no supporting framework, pairs of these sheets were bolted together to form an inverted 'U', with another three flat pieces making up each end, one of which incorporated a doorway. The owner had to dig a 4 foot deep hole in their garden, to accommodate the 6.5 ft x 4.5 ft x 6 ft high room, and use the excavated earth to cover the structure with at least 15 inches of soil for added protection. Pictured in a lane beside the Kilcreggan AA Battery at Cove, on the Rosneath peninsula, this example appears to have been abandoned or discarded. Missing its flat end pieces and doorway, it provides a view of the bolts which secure the eight roll-top sections together to form the hut's characteristic inverted 'U'. A modern house known as the Tinhouse on the Isle of Skye was among 27 contenders nominated for the Royal Incorporation of Architects in Scotland (RIAS) 2017 awards. Judges said the house celebrated the type of corrugated metal sheeting commonly used in agricultural (and other) buildings in a contemporary way. 1 ⇑ Vale of Leven place names beginning with T Retrieved February 14, 2012. 2 ⇑ Tinhouse among best buildings shortlist - BBC News Retrieved 6 April 2017. Cove's Tin Hut Church demolished Retrieved April 12, 2013.